I hope everyone is having a great weekend! :) I'm swatching my heart out today, but have a fun trip planed for the aquarium tomorrow with the husband and little one. Bridezilla is made with assorted dots, hearts and flowers in pink and white, as well as white skulls a clear base with warm and cool pink shimmer. All nails are 1 coat over 2 coats of Lynnderella Open Me. 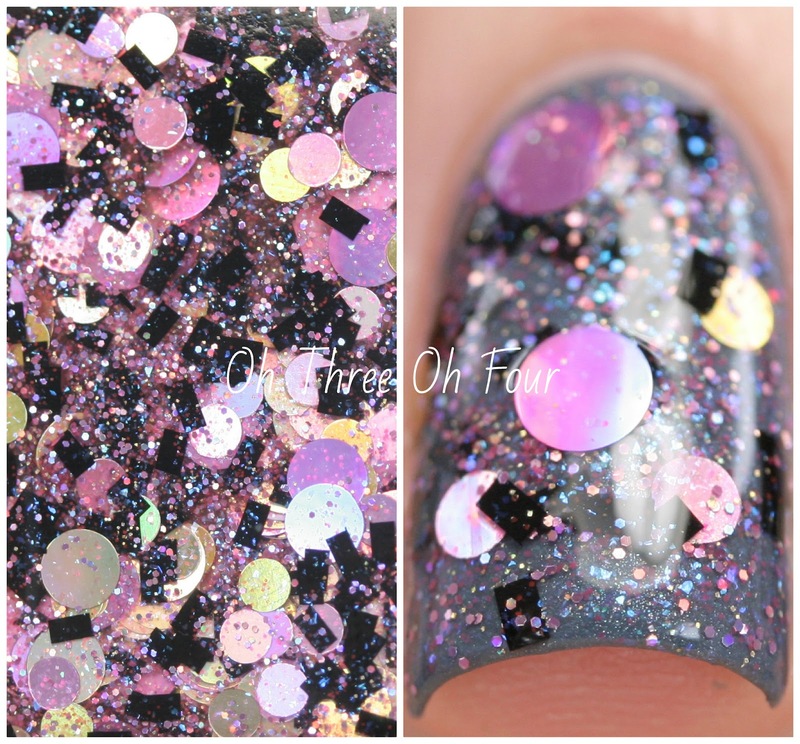 Bubble Juice has gold and lilac-pink holographic dots, black rectangles and microglitter. Clear multi-shimmered base. These photos are 1 coat of Bubble Juice over 2 coats of Finger Paints You Yacht to Know Better. Cran was Saucy at Dinner has burgundy, assorted reds, neon pink and orange glitters with a multi glitter accent in a warm pink shimmer and a clear base. Shown is 1 coat over 3 coats of Lynnderella LavenDearest. Half to Love You has assorted large red, magenta, lavender and pink glitters in a multi-shimmered clear base infused with micro-glitter. All nails are 1 coat over 2 coats of Sally Hansen Lemon Shark and added extra loose glitters. 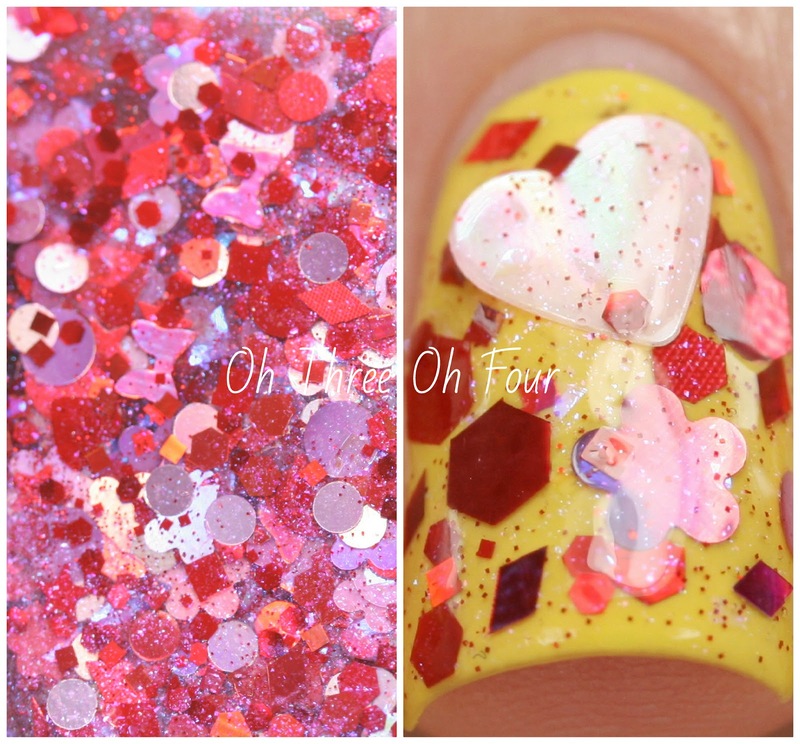 Heart of the Matter is made with assorted lavender, pink, red and orchid glitter in a bed of red-pink jelly glitter and a multishimmered clear base. Here is 2 coats over 2 coats of Essence Baby, Baby, Ooh!. Heart Spring is made with assorted lavender, orchid, nearly neon red, neon pink and mint glitter in a bed of red-pink jelly glitter and a mint- and pink-shimmered clear base. All nails are 2 coat of Heart Spring over Revlon Violet. In the Cards contains assorted hearts, clubs, spades and diamonds in black, white, reds and pinks in assorted finishes. 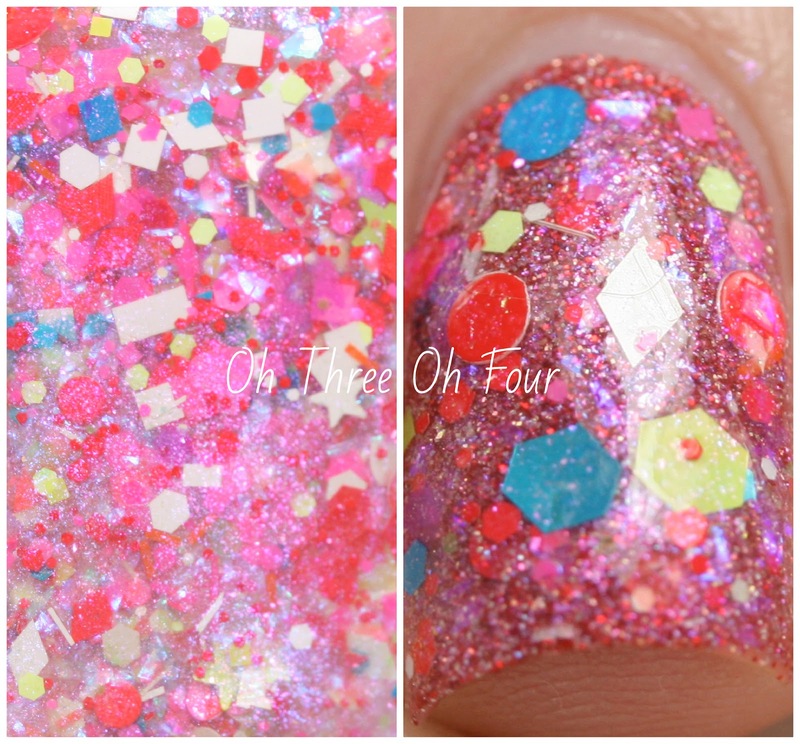 It has a subtly pink clear base with hot pink rainbow dust and pink shimmer. Shown is 2 coats over 2 coats of Finger Paints My Art Belongs to You. My Unicorn Lover is made with neon pink, nearly neon red, assorted neons, white, iridescent blue glitter and multishimmer in a clear base. Here is 1 coat of My Unicorn Lover over 3 coats of Nail Bed of Roses. Nail Bed of Roses is a red microglitter with holographic and multi-shaped glitter accents in a red base. These photos show 3 coats with top coat. Pink Starfish is a pink jelly with neon pink, holographic and white satin stars accented with holographic microglitter and pink shimmer. All nails are 3 coats with top coat. 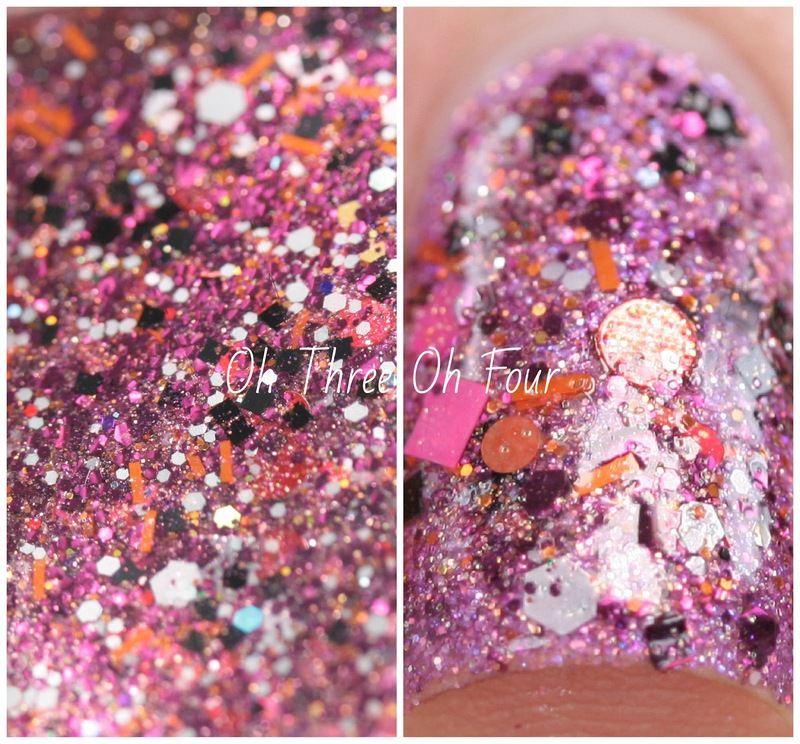 Princess in Punkatory is a mixture of hot neon pink and multi-glitter in a translucent lilac-shimmered pink base. Shown is 1 coat over 2 coats of IBD She's Blushing. Quadropus Holographae contains assorted magenta, fuchsia and red glitters as well as holographic magenta skulls (octopi ;) ) in a sparkling magenta-shimmered semi-sheer magenta base. Except my ring nail, all nails are 1 coat of Quadropus Holographae sandwiched in between L'Oreal Miss Pixie. My ring nail is 1 coat of Quadropus Holographae over 3 coats of L'Oreal Miss Pixie. Sweet Spot contains cool-toned pink matte and satin glitters in a clear blue-pink shimmered base. Here is 2 coats of Sweet Spot over 2 coats of Finger Paints Sparkle in the Sky. 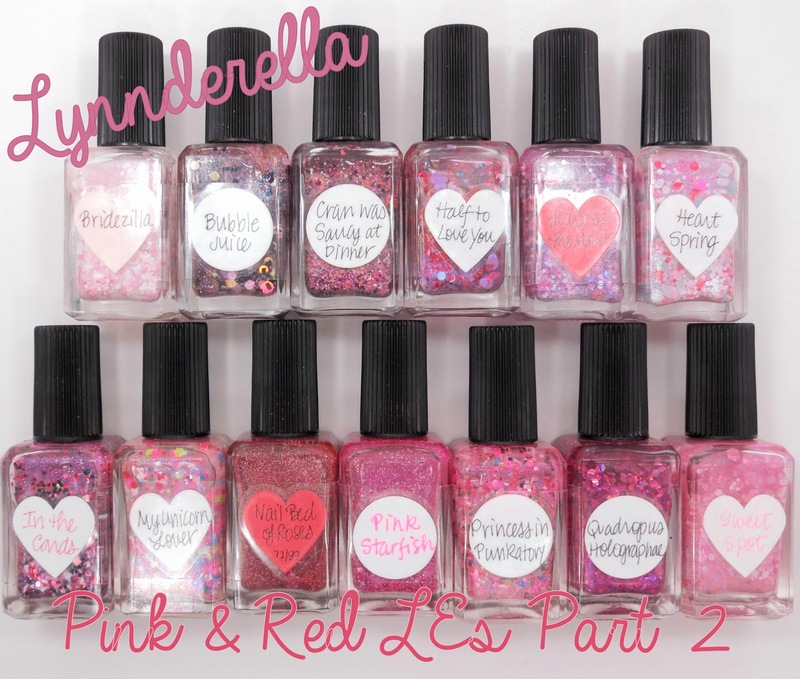 Lynnderella limited edition and core lacquers can be purchased through Lynnderella.com. International ladies can purchase core lacquers from Norway Nails and Glitter Connect. Be sure to follow all the Lynnderella fan pages on Facebook, Twitter, Instagram, Pinterest and Tumblr! Don't Be Blue on Valentine's Day Giveaway!